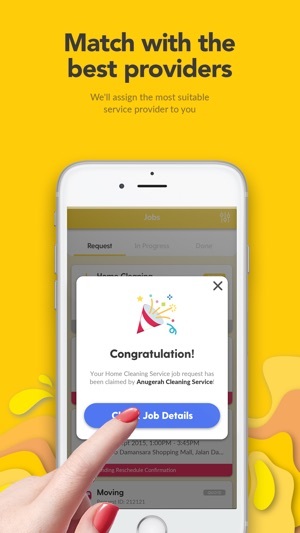 ServisHero helps you find the most trusted and skilled professionals to help you get your household tasks done. 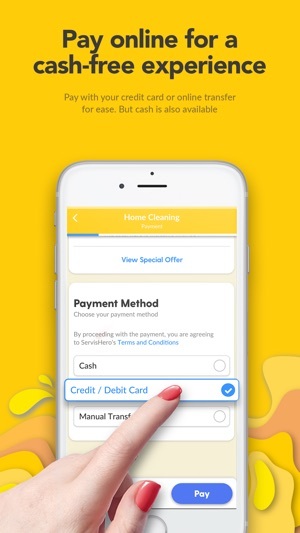 Available in Malaysia, Singapore and Thailand, ServisHero will instantly match you with the best service professionals for the job. We guarantee fair pricing with secure online payment and insurance coverage for all jobs hired via the platform. ServisHero exists to make your lives easier! 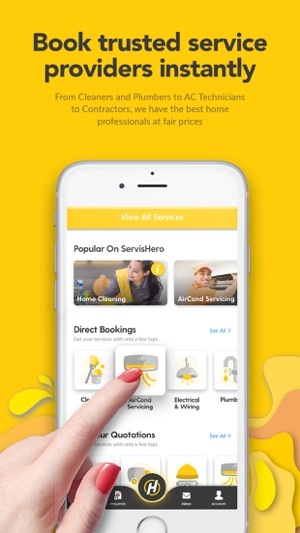 Download the free ServisHero app and browse through a multitude of service categories. You can hire cleaners, AC repair professionals, plumbers, handymen, personal trainers and more. Try ServisHero for free today! Are you looking for a cleaner or a plumber? Need help moving to your new home? 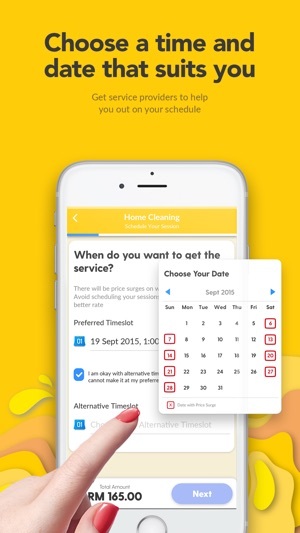 ServisHero can help with all your household tasks. In addition to being able to compare quotes from several trusted providers, our Direct model allows instant booking and payment for cleaning and the AC servicing. With secure online payment solutions, you can not only be assured of fixed prices, but also financial safety and security during the transaction. Hire without the worry of damages and theft that may occur during the job as all jobs hired via ServisHero are protected with insurance coverage up to RM100,000. Easily browse, review and rate professionals once the job is done and get in touch with our world-class customer support team if you need any assistance throughout the process. Download the app today and submit a job request for Free, and find the best professionals. We deliver on five key principles to ensure that 100% satisfaction is guaranteed. 1. Quality & Reliability – Only the most trusted and skilled service providers are found on ServisHero. Professionals are thoroughly vetted and trained before servicing customers. 2. Security – We use market leading digital payment infrastructure to make sure your payment and info is safe with us. Download the app today and find out how we uphold to all our promises. 100% Satisfaction Guaranteed. Too many to list with more launching regularly! Download the app today to find the complete list of all the latest services available in your city. ServisHero is available in Malaysia (Klang Valley, Johor Bahru and Penang), Singapore and Thailand (Bangkok, Chonburi). We are growing fast so check back soon to find out if we are in your area! ServisHero is on a mission to improve the service industry in Southeast Asia. We are dedicated to raising service standards and lifting income levels for thousands of service professionals and small business owners. We'll still deliver the same great experience, whether you typed in servicehero, service hero, or even servis hero to find us. 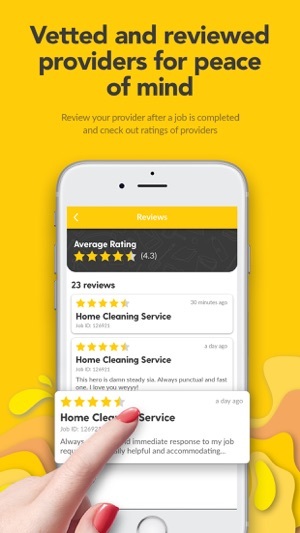 We are on-demand mobile app and an evolution of the traditional directory service, yellow pages or local business listing. We take the best of mobile technology to make finding local businesses easier, more convenient and safer. I managed to get a team to clean my house within one day’s notice and at a weekend at that. The manager of UCR Cleaning Services constantly updated me on the status, including informing me when the team would be arriving 30 minutes later than scheduled. The team completed all the tasks within the time allocated, although I had to guide them how I wanted the cleaning to be done. Thank you very much for w job well done! The cleaning company did contact me for approval by only sending one maid for work due to the second maid is not feeling well however the 6 hours cleaning was not clean at all and doesn’t worth the money! The maid didn’t clean our main living room and the both toilet at ground floor! In fact the maid should inform us before she leave if she didn’t manage to clean any area in the house but never! (Hero Service I had send you guys a PM few days back before this review but there’s is not respond from your side! What is this now???) P/S: If only i could post the picture image as evidence here! My biggest annoyance with this app is their usage of push notifications to send you promotional content. There is no option within the app to turn it off. The only way around it is to turn off push notifications entirely, but that means losing notifications for when you receive quotations on your job offers.